Front of the silver medal awarded to R.T. Underhill in 1847. 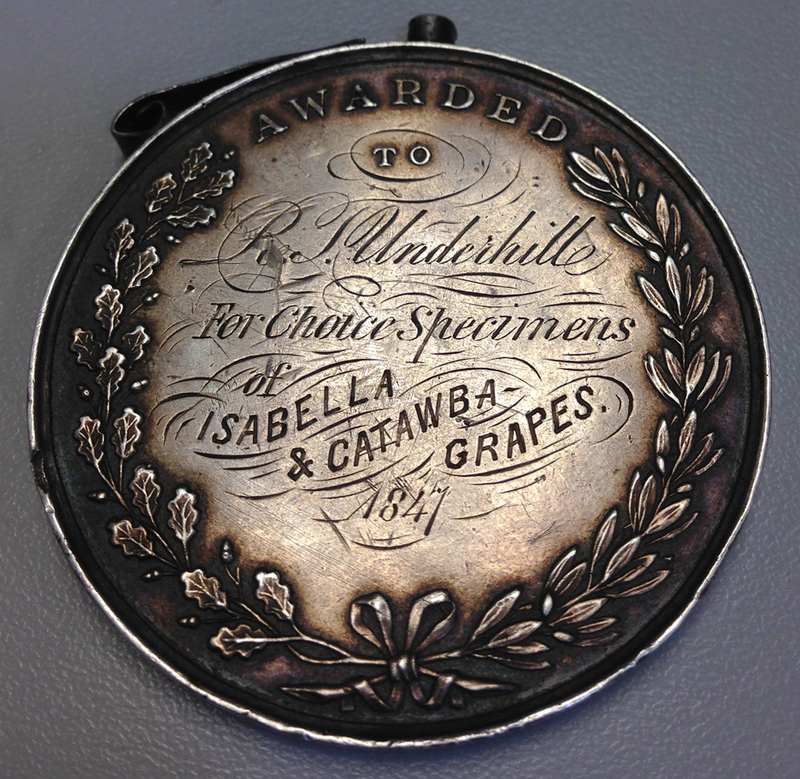 How did a silver medal from 1847, awarded to R.T. Underhill for the grapes he grew on Croton Point, end up buried in a garden on Long Island? That’s what reader Mike S. wants to know. For Mike, his treasured “lucky charm” has become something of an obsession. 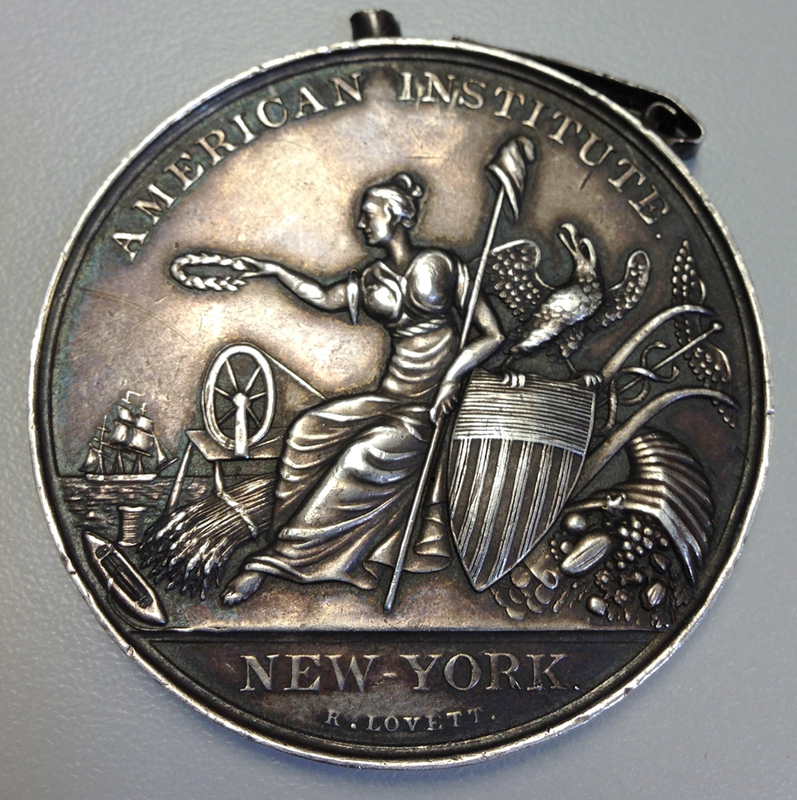 What was the American Institute, the organization that awarded the medal? Why is “R. Lovett” stamped along the bottom of the front side? How did the medal get buried in his grandfather’s garden? We can answer all his questions—except the last one. As readers of this blog know, Richard T. Underhill was the “Grape King,” who built the first commercial winery in the United States on Croton Point. He began his vineyard by planting European varieties of grapes he purchased in Brooklyn from André Parmentier, a wealthy, educated Belgian who came to America to escape the French Revolution and started a nursery that included a vineyard. At first Parmentier sold only European grapes, but it turned out that they did not grow well in New York. Detail from “Gathering Grapes—An October Scene on the Hudson,” a wood engraving published in Harper’s Weekly. The image depicts the Underhill vineyard in 1867. 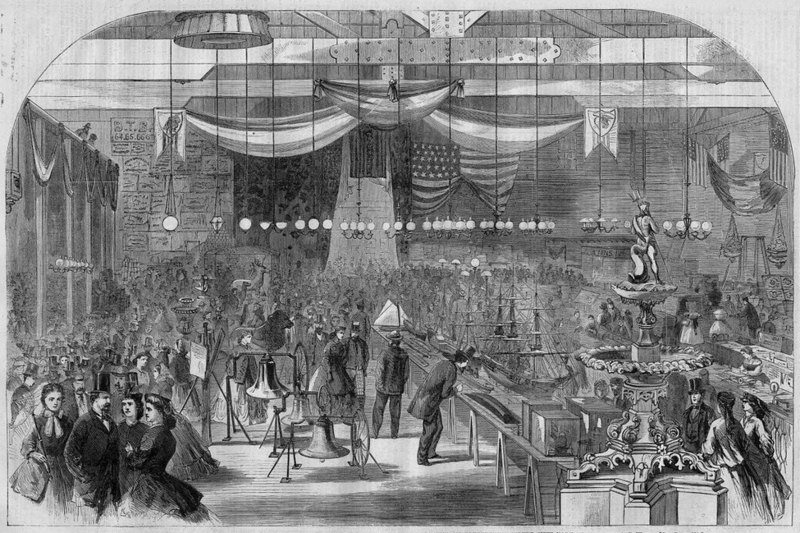 View of one of the American Institute’s fairs from Harper’s magazine. The American Institute of the City of New York (also known as the American Institute of the City of New York for the Encouragement of Science and Invention) was founded in New York on February 19, 1828, to encourage and promote “domestic industry in this State, and the United States, in Agriculture, Commerce, Manufacturing and the Arts, and any improvements made therein.” It attempted to fulfill that task by two means: first, by organizing annual fairs at which prizes were awarded to outstanding artisans and inventors, and second, by actively promoting government policies that would encourage and protect domestic manufacturing, agriculture, and commerce. The medal awarded to Underhill was designed by Robert Lovett, Sr., the patriarch of a family of famous engravers. He was born on March 19, 1796, and grew up in a quiet New York City neighborhood in an area now covered by the western end of the Brooklyn Bridge. After a brief military service during the War of 1812 he apprenticed in the shop of master stone seal engraver Thomas Brown. 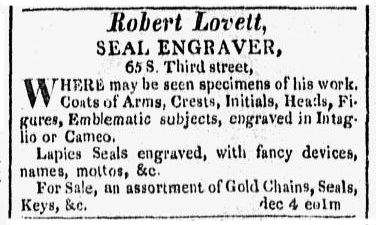 Advertisment from Poulson’s American Daily Advertiser, [Philadelphia], January 15, 1818. Lovett has another Croton connection—he designed the medal produced for the Croton Water Celebration, when what we now call the Old Croton Aqueduct opened to public use on October 14, 1842. See an example of that medal here. How did the medal end up buried on Long Island? The Underhills do have deep roots there. Capt. John Underhill (1608/9-1672), the founder of the oldest and largest Underhill family in the U. S. and Canada, lived at various times in Flushing, Southold, Setauket and Oyster Bay. One can speculate that perhaps an Underhill relative had once lived in Mike’s grandfather’s house. Whatever the case it’s great to be able to share this medal with our readers.